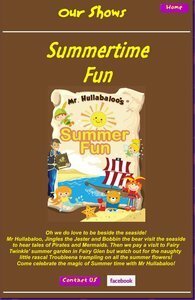 Mr Hullaballoo, Jingles the Jester and Bobbin the Bear visit the seaside to hear tales of Pirates and Mermaids. Then we pay a visit to Fairy Twinkle’ summer garden in Fairy Glen but watch out for the naughty little rascal Troubleena trampling on the summer flowers! Come celebrate the magic of summer time with Mr Hullabaloo!